Ever seen a plant fail to thrive because it had shallow roots? Your first chakra is the rooting or grounding that connects you deeply to the earth. It also provides the foundation for all the other chakras. It’s a yang chakra. It’s connected to our masculine essence, rooting us in the physical with a powerful will to live. About the symbol for this chakra: Mystics saw this chakra as a four-petaled lotus blossom, representing the four elements. The square represents the material world. The triangle represents the earth-oriented downward direction of this chakra. 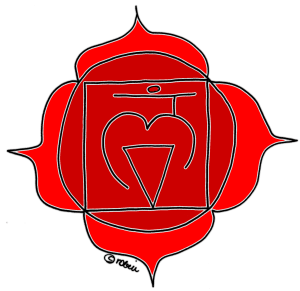 The other symbol represents the Sanskrit word for this chakra: Muladhara. What energy is it associated with? Survival, will to live, belonging, feeling welcomed. What kind of thought and feeling stuff is this chakra affected by? What keeps you from being here in the moment? What keeps your awareness from being in the present moment? What scares you? What makes you feel anxious? This is the stuff that tends to un-ground you. The collective consciousness of your family is stored here. This tribal vibe has an influence on beliefs, fears, and general ways of life. When you feel held back, stymied by your past and unable to move forward, you can bet your first chakra has been affected by what’s going on. This chakra is related to issues of meeting physical needs. Finances, shelter, food, clothing, safety and feelings of security are all first chakra issues. How can you open this chakra? Get moving. Dance, jump up and down, kick, run, walk, bike, skate. Try some yoga, tai chi or qigong to open your energy centers and ground you more deeply. Follow your breath. There are many fancy breath techniques out there! I’m a fan of just taking some slow and deliberate in and out breaths. Just bringing your awareness to your breathing will ground you. Yoga poses such as Bridge, Locust, Child’s pose and forward bends are great. These bring you into deep contact with earth energy. Eating is a very grounding thing to do. Proteins are especially helpful to the first chakra. Go easy on the meat–it can actually slow you down because it takes a long time to digest. Try adding some lentils, quinoa, kale, or broccoli to your diet- all are very protein dense. Watch the tendency to overeat – this is a self-soothing practice that actually throws you out of balance. Rest and relaxation are wonderful for grounding your first chakra. Doing less, and resting more is being kind to your body. Sleep is a wonderful way to reboot your first chakra. If you tend toward sleeping a lot- this is more likely to throw you out of balance, try movement instead. Essential oils are the life force of a plant. The healing energy of a plant is literally inside the oil. Try rubbing the oils on your feet, or putting a few drops into your hands and cupping your nose- breathe in the scent. An epsom salt bath with 10-15 drops of essential oils added to the water is wonderful and energy cleansing. Patchouli, sage, sandalwood, cypress, cedarwood, frankincense, clary sage, geranium, rose, melissa, vetiver, and ylang ylang. What healing exercises can you do to help ground this chakra? Stand up. Whenever you feel afraid, or nervous, or frozen, just stand up. As you are standing, let your entire body relax and soften. Breathe in, all the way to your belly, and let that breath out slowly. Consider that the earth is supporting you in this moment. It is literally holding you up. Holding you. Allow yourself to make an energetic connection to the earth, in whatever way feels right to you. Remind yourself that you are safe, that you matter, that you belong, that you are welcome here. Read on about the second chakra >> here. If you haven’t seen my post about the seven major chakras, you can read it here.